Another year… another major LoopLink update. This year’s major update includes the usual bug squishes and nip/tuck tweaks to layout and interface but the really big stuff this year is all about adding more flexibility and control for geothermal loopfield designers. We are proud to introduce Heating Offset and Heating/Cooling Start Temperature adjustment as well as a peppering of enhancements that will make your life easier. Heating Offset is a new parameter that can be defined on a zone by zone basis. With the Heating Offset, you can now account for static internal gains on the heating side. This more accurately calculates loads and subsequent loop lengths for zones that will have a predictable constant amount of heat generated within the space by equipment and people. The Heating Offset is also used to calculate a Heating Start temperature that better reflects when the space will require the geothermal system to start heating. We could have just put a field on the page and let you figure out your own heating offsets but that isn’t our style. We built a custom Heating Offset Estimator that you can use to estimate each zone’s static internal gains. 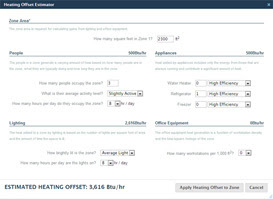 Input square footage, occupancy, light level, common appliances and/or workstation density and LoopLink will return an estimated heating offset. Check out the full overview for complete details. In early spring and autumn, outdoor air temperatures are comfortable. Windows are opened and we air things out, which means, we aren’t heating or cooling our inside spaces with geothermal. In the past we allowed only a small amount of control over when a system would be in operation. With the heating and cooling start temperatures you are now able to define the temperature at which the building owner is likely to shut the windows and condition the air. This gives you much more flexibility in controlling the hours used in your bin analysis which can have a significant impact on run times and loop lengths. The project summary page was admittedly, a little lack luster. It was a just a list of page names with checkboxes and a button labeled “Generate Report”. We took a little time in this update and thought about how we could improve things (unfortunately, the Nintendo Super Mario Kart emulator was nixed early on). We ended up changing the layout and organizing the page into sections. We also made it easier to specify which sections you want in your report with section based toggles. Additionally, we improved the error detection logic and made it easier to add elements to your LoopLink projects directly from the summary page. Have you ever just needed to run your project summary without changing your project? Now you can! We added a print button on the project list that will allow you to jump directly to the new and improved project summary page from your project list. We definitely have not and will not list ALL of the changes we have made... most of them are just too small for anyone but us to care about. Below are some of the smaller but still noteworthy changes we made this update. Hot water costs and CO2 Emissions are now accounted for in the Operating Cost Summary. We improved the section labeling to add clarity to what information you need to provide within each section. It is now possible to remove screen and print logos from your account. Error Messages now detect when you edit a problem field and clean themselves up as you work. Save Confirmation messages are now set to fade out once you make a change on a saved page. Dual Fuel Runtime and Supplemental Runtime have had their labels updated to Dual Fuel Bin Hours and Supplemental Bin Hours to better reflect what they are reporting. Improved print resolution of Zone Load and Operating Profile Graph. Users can now change the name on their account. Gain Level on project details changed to Building Type to improve clarity.